Nothing will be as good as the original but this one was pretty funny!! Took grands to see this ( 6 & 9 years old) and were OK with it. 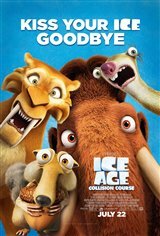 I felt it didn't come close to the first Ice Age and message was not nearly as clear. Long volcanoe scene. It was great it was funny and light I will see it again. It was well done and everyone will hopefully enjoy it. Took my kids to see it and they were mildly amused. It's just another cash-grab. Entertaining and enjoyable. Liked the past 4, is there gonna be a future one?